Monday Funday: Did someone say peacocks? Happy Monday everyone! We hope you all had a great weekend and are preparing to have an even better week! Today’s post is about peacocks! Yes..we actually said peacocks. We love when a couple chooses to do a themed wedding because, they are so different from what we normally see! This theme is one we find especially unique. The colors inspired from this trend are absolutely gorgeous! Want to start the ceremony off with a bang? Use these flower petals before you walk down the aisle! The tie and boutonnière are the perfect combination for this theme! And look at the pocket square! This four tier cake is something truly amazing! The peacock feathers in addition to the blue ribbon is gorgeous! Incorporate the colors into your bouquet because it will definitely make it pop! Finally, do you want guests to take the theme with them? Rock candy in the colors from your theme is the perfect thank you gift! Also, don’t forget to follow us at The Dandelion Patch on Facebook, Instagram, and Twitter so you can see our updates! Monday Funday: Colored Gowns and Tuxes! Happy Monday everyone! For todays blog we are going to be talking about some of the new trends in wedding fashion. Colored dresses and tuxes! If you’re not a traditional bride and are looking for something totally outside the box for your wedding dress, then maybe a two-piece wedding gown is the perfect match for you on your big day. This is becoming more and more popular, especially since the boho trend is still on the rise. We are currently loving this trend and we hope it continues! We love the idea of being able to mix and match, wether it is textures or colors! Lace is always a great option for the top! Add some color into your dress! This lets the bride be more creative with the overall theme of their wedding. Feeling like having a dark and stormy wedding? Make your dress black to incorporate the overall theme. Less can always be more especially when playing with color schemes. If you want to add a little pop of color you can always make the grooms tux a different color! Feeling a little bolder? Pick a more vibrant color to stand out like this gorgeous red color! Finally, if you want to keep your dress simple and elegant you could always change up your bridesmaid dresses! Incorporating color and different textures into dresses is a big trend today. Some, but not all brides want to step away from the traditional gown and have their dress be a little more modern. For more updates about other trends and our Real Wedding Wednesday posts be sure to follow us at The Dandelion Patch on Facebook, Instagram, and Twitter! The wintry weather doesn’t excuse anyone from its chilly touch – not even the prettiest of brides and bridesmaids! But no worries, we’ve found some lovely solutions on our shoulders, (literally). Check them out below! Use your scarves and shawls to highlight the undeniable beauty of some of this season’s classic palettes! Watch how these ladies stand angelic and all aglow draped in shimmery winter wonder! You can never have enough of classic tri-tonal-plaid blanket scarves! Vibrant contrasts make quite the visual statement, don’t you think? Matching fur collars not only look oh-so-chic and fabulous in photos, but they’ll also keep your girlfriends cozy and warm during your winter wedding! Colorful scarf giveaways with a smart little rhyme – how practical and adorable! For all who are uniform-phobic: here’s a chance to spontaneously mis-match the heck out of a “let’s-coordinate-everything!” occasion and still look absolutely charming! A chic indie fringed wrap might not be the ideal winter-season look, but it certainly holds an excellent sprinkle of texture for any who prefers something unconventional! While thin, textured scarves hold certain appeal, how can one not be utterly smitten by matching half-mitts? Red and green for the holidays, white for the bride, and GOLD – just because there’s no such thing as too much golden-glory-glam for occasions like these! Pick and choose your wrap accessories colors wisely, because they might feature well in some custom curated invitations! In the meantime, check out our pretty paper gallery at The Dandelion Patch’s Facebook, Instagram, and Twitter for more inspiration! Alas, we part ways with yet another year’s Thanksgiving dinner – but not being taking a snippet of that as inspiration for the future! As we take a moment to reminisce the incredibly satisfying feast from last night, we pick up on the rich splashes of autumnal tones in the vegetables present on the table and cannot help but wonder how delightfully refreshing they might look in their most natural form. Hence we bring you today’s trend alert! 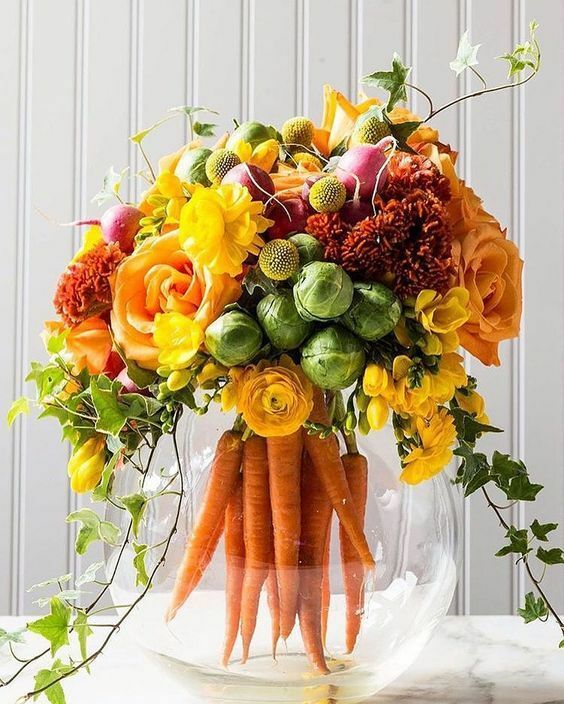 Table setting and centerpieces that incorporate the season’s harvests and spices are sure to wow your guests in their organic charm! Follow The Dandelion Patch on Facebook, Instagram, and Twitter and stay tuned for regular updates and real wedding features! Be sure to check out our pretty paper collections as well! The idea of bows on dresses seems like such an antiquated, childish concept, but we’re seeing a recent breakthrough of bow decoration, especially in wedding fashion! When you’ve only got one main color to work with, you’ll find these bows blooming on dresses in surprisingly fresh and contemporary directions! Keep reading to see a sampling of variations in bow size, shape, color, and location on your next bow-adorned dress! Simple, clean and crisp, a tailored bow at the waist accessorizes with expert subtlety! Multiple bows along the spine create exciting, symmetrical reveals of skin! Juxtapose the backless, tulle-train dress with a basic, thick-ribboned bow! If you prefer to keep your body bow-free, how about we bring them up to your sleeves? What happens when we stack an intricate lace bow over a similarly laced bodice and gown? Here’s a bow that speaks larger than life! Try a ribbon of a different shade for a steady pop of color against your all-white gown! Add a bow to your stationary! Connect with The Dandelion Patch on Facebook, Instagram, and Twitter to check out some of our custom designs! Or, even better, come browse through our ribbon collection in person, select a color and material, then discuss where the ribbon should go on the paper – just like those bows on the dresses!